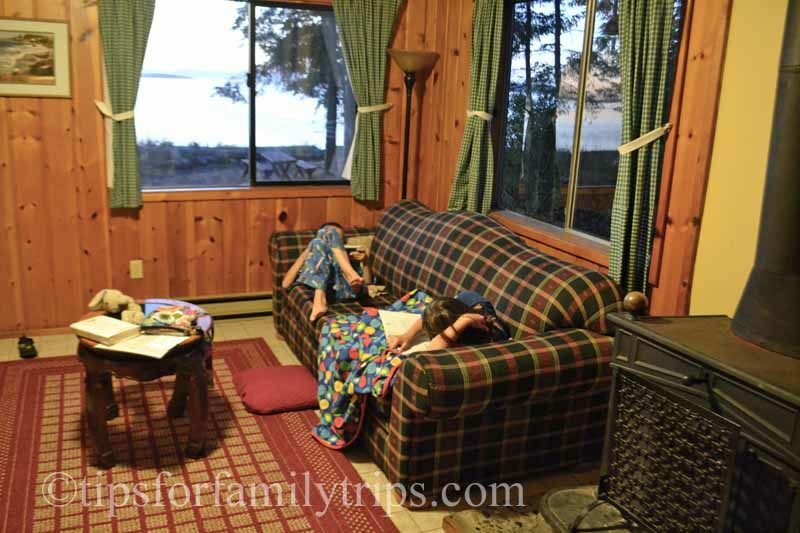 One night at North Beach Inn on Orcas Island was just not enough. We visited earlier this summer on a whirlwind tour of the beautiful San Juan Islands. We figured out a little late that we should have planned our itinerary around the ferry schedule, and were only able to enjoy one evening on Orcas Island before catching a ferry to Victoria, British Columbia early the next morning. It happened to be our wedding anniversary, and Mother Nature seemed to know that we needed something special. Here’s how my husband and I finished the day on our own little stretch of beach. My kids don’t yet know how to appreciate a sunset, and quickly found that we had no WiFi or television, so they each settled in with a good book. If you are ready to disconnect and really get away from it all, North Beach Inn is the place to do it. Our little beach house was stocked with a few books and board games for various ages and interests. North Beach Inn is a collection of rustic beach houses along a quiet stretch of pebbled beach. It is located 10 miles from the ferry dock and just a couple of miles from Eastsound Village where you’ll find a number of charming shops and restaurants. A forest and a dirt road lie in between, so you’ll feel like you’re a million miles away. Learn more about North Beach Inn on TripAdvisor. Click HERE to read more traveler reviews. If I had a beach house of my own, it would probably look a lot like our three-bedroom house at North Beach Inn. It was filled with well-worn furniture, bedding and towels. The kitchen and bathroom were clean and up to date. We had a back porch facing the water with a charcoal grill and a set of sturdy adirondack chairs, perfect for sitting around a camp fire on the beach. The neighbors were close enough to be friendly, but far enough for privacy. North Beach Inn is family friendly and pet friendly. It would be a fun place for a family reunion. It is centrally located on Orcas Island, making it easy to explore by car, bike or boat. North Beach Inn has been family owned for 100 years, and members of the family live on the property. A variety of cabin sizes are available, from studio to 3-bedroom. Make your reservations for summer early! We tried to add a second night a couple of weeks before our trip, and even though it was mid-week and early in the summer, North Beach Inn was already full. We stayed in Fraser Cabin. Here are a few more photos of Fraser and North Beach Inn. Disclosure: Our stay at North Beach Inn was complimentary, for the purpose of review. All opinions are my own. Want more information about North Beach Inn? The best place to book North Beach Inn is on their website www.northbeachinn.com. Read more traveler tips and reviews at TripAdvisor. Need help getting around? Driving your own car onto Washington State Ferry is the best way to reach North Beach Inn. The resort is located about 30 minutes’ drive from the ferry dock. Get all my do’s and don’ts for the ferry in this post: What NOT to do on Washington State Ferries. Find the best rates from dozens of agencies at RentalCars.com.